Yes, my headline is misleading. You can’t take a Metro bus or train to Arizona, but you can take one to Union Station. And from Union Station you can take an Amtrak train to Arizona. Heck, you could go all the way to Chicago if you so desired. In fact, a gentlemen who sat next to me on the Amtrak Southwest Chief last Wednesday was doing that very thing. That’s a three day journey, an amount of time that many of us don’t have to spare. My destination, Flagstaff, AZ, was a more reasonable, but still lengthy 10 hours away. For me it’s worth it to visit my parents on Thanksgiving and save myself the cost and stress of air travel or renting a car. 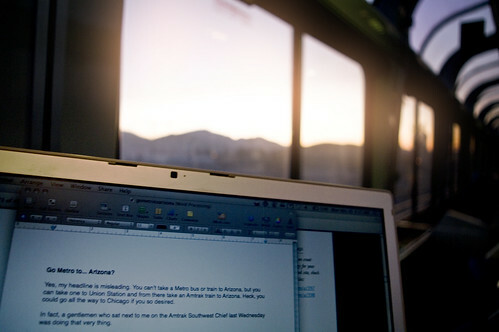 Plus, there’s nothing like writing a blog post while sipping fresh coffee in the lounge car of a slow train to L.A. as the sun rises over the Cajon Pass. Union Station is not just the hub of three of Metro’s rail lines (Red, Purple, and Gold), multiple Metrolink lines and over 30 bus routes. It’s also the regional hub for Amtrak, the oft misunderstood and mocked national passenger rail system here in the good ol’ U.S. of A. As a car-free Angeleno my L.A. does have a center, and it’s without a doubt Union Station. In many ways it’s as much of my escape from L.A. as LAX. Even when I do fly out of LAX, Union Station is always part of my journey thanks to the FlyAway bus. But this post isn’t about LAX, it’s about how to Go Metro to go Amtrak. Union Station is directly served by four Amtrak routes, each with fanciful names that conjure up romantic images of passenger rail’s golden era. Four Amtrak routes intersect with Union Station in Los Angeles. Unofficial Amtrak map from Mapmash. The Pacific Surfliner is a 350-mile route that travels between San Louis Obispo and San Diego. It’s also Amtrak’s most popular route outside of the Northeast, so if you’ve ridden Amtrak at all in California, it’s probably been on the Surfliner. From L.A. you can get to San Diego in about three hours (for $29), Santa Barbara in two and a half hours ($23), and San Louis Obispo in five and a half hours ($32). The vistas on this route are stunning as it passes along the Pacific for much of the time. The San Diego Station is in the heart of downtown where you can easily get around on San Diego’s light rail system, and Santa Barbara actually has a website encouraging car-free vacations (and they offer a 20% discount on Amtrak). I’ve been to both Santa Barbara and San Diego multiple times on the Pacific Surfliner and wouldn’t think of doing it any other way. The Coast Starlight runs 1,377 miles from Union Station to Seattle, Washington. To ride the whole route takes a whopping 35 hours, and that’s if it’s running on time (apparently on-time performance has improved significantly since 2005). However, there are more useful stops along the way including Oxnard, Santa Barbara, San Jose and Oakland. This spring my girlfriend and I took the Coast Starlight to Oakland, which takes about 10 hours, and transferred at Jack London Square to a BART train for a 15-minute ride into San Francisco. My girlfriend, who is not car-free crazy like me, had a fantastic time despite the length of the journey. 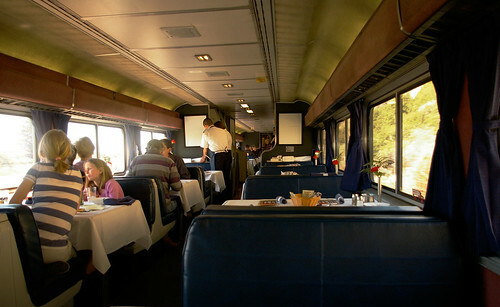 There’s something undeniably romantic about train travel, and that romance comes to life on the Coast Starlight when you’re sitting in the dining car (although the food is just so-so) with a constantly changing view of the Pacific coast. The Southwest Chief, the train I take when I visit my parents in Flagstaff (which is actually a pine-covered mountain town, not the desert like much of Arizona), is a monster route that spans 2,256 miles from L.A. to Chicago. To go the entire route takes 42 hours. The train leaves Union Station in the evening and typically arrives in Flagstaff 10 hours later. This means you’re probably going to want to sleep, but I rarely have a problem because the chairs are plush and recline dramatically. Now, it’s usually not a perfect night’s sleep, but if you avoid caffeine and bring a blanket, you’ll be fine. I never splurge for a roomette which can more than double the cost and never seems worth it to me. It would be nice if this route traveled during the day though because the sights along the way must be a wonder to behold. After Flagstaff, it’s another seven hours to Albuquerque. A 17-hour trip sounds pretty grueling, even for me, but you’d be surprised how many people on my packed trains this holiday weekend were making that very trip. One negative about the Southwest Chief: no power outlets (at least not for coach seats). The route I have yet to ride is the Sunset Limited which travels almost 2,000 miles from L.A. to New Orleans. Closer stops include Palm Springs (2 hours, 30 minutes) Maricopa, AZ (7 hours, 30 minutes) and Tucson, AZ (9 hours, 30 minutes). There’s one other route that doesn’t serve L.A. directly but Amtrak offers coaches at Union Station that connect to the San Joaquin in Bakersfield. The San Joaquin travels through Central Valley to Oakland. 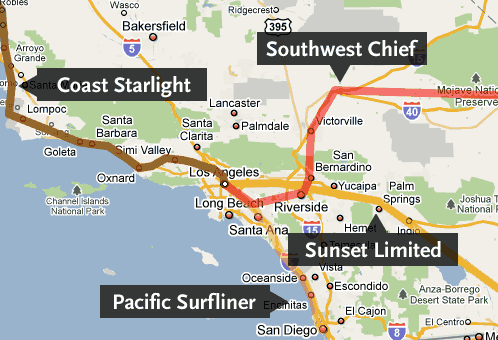 Clearly there’s no shortage of options for rail travel in California and the Southwest. If you live in L.A., whether you’re car-free or not, you owe it to yourself to get to Union Station and give Amtrak a try. For the shorter trips, even my 10-hour trip to Flagstaff, Amtrak is a viable alternative to air and car travel. Sure it’s slower, but much of the time it’s much more cost-effective (be sure to check if you qualify for any Amtrak discounts), and it’s undeniably more comfortable. By traveling by Amtrak over the Thanksgiving holiday I saved about $150 compared to flying into Flagstaff. The cheapest coach seats on the train put first-class airline seats to shame, and that fact that you can get up and walk around at anytime, even enjoy a cold (perhaps alcoholic) beverage at the cafe, makes it a travel experience unlike any other. You can arrive at the station 10-minutes before the train departs, not 2-hours ahead of time as with air travel. No lengthy and embarrassing security procedures (you can keep your shoes on). Green: according to Amtrak, trains use less energy per passenger mile than cars or airplanes. The biggest issue with traveling by Amtrak is on-time performance. Since Amtrak shares tracks with the freight railroads that own the tracks, the freight trains get right-of-way and thus Amtrak’s performance is completely reliant on the performance of the freight railroads. When traveling by Amtrak, you expect your train to come to a complete stop for up to 15 minutes as a freight train passes by. Unfortunately, it’s not uncommon for a train to arrive late, and sometimes hours late. In a nice gesture of transparency, Amtrak now publishes historic on-time performance on their website, which can help give you an idea of which routes, and which particular trains on those routes are most reliable. If you have to get to your destination as fast as possible, Amtrak is probably not for you. Schedules can be limited, requiring more flexibility with your travel plans. If anything, taking a slow train a few hundred miles is all about the journey. Where other modes of travel are all about getting to the destination as fast as possible, Amtrak allows you to start your vacation once you set foot on the train. Peering out the large windows at the passing scenery, talking with other passengers in the lounge car, having a drink in the cafe – all of these things make train travel more enjoyable than the alternatives. And, as much as I love a good road trip, I would have never been able to write this post while watching the sunrise if I was behind the wheel of a car.